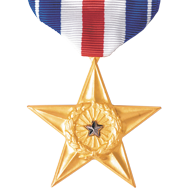 The Silver Star is the third highest U.S. combat-only award. Established in 1918 as the Citation Star, in 1932 a provision allowed servicemen to receive it retroactively. It has been awarded for actions as far back as the Spanish-American War.